Watch was exactly what my husband wanted! It is not oversized, and fits his wrist (his height is 5’6) just perfect. I love how dark it is. Hubby says it is hard to read sometimes though because it is so dark, but loos really cool! Highly recommend. 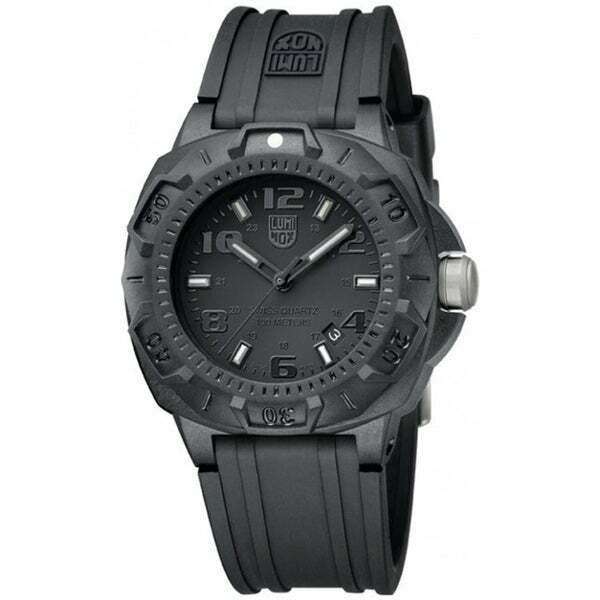 This rugged Luminox Sentry watch features a carbon-reinforced polycarbonate case and bezel with a comfortable polyurethane strap. Tritium capsules allow for excellent nighttime illumination and last for up to 25 years. Great style and rugged appearance. Quality watch. I bought this watch for my husband as a Valentines Day gift. Apparently, it never kept time well (he had to reset it every few days). However, he didn't share this detail with me as he didn't want to hurt my feelings. (Ugh). Now that the watch doesn't keep time at all, he's divulged this fact and it is past the 30-day return policy. I'm going to have a new battery put in to see if that corrects the problem but am not happy about having to do that less than 6 months after the purchase. Hopefully, this will remedy the situation and my husband has learned that I am NOT thin skinned. "I have a 9 inch wrist. Does the 8 inch band include the width of the watch?" Thank you for your question, bpetrell. Yes that does include the case, but this watch can also be sized to fit wrists from 7.5" to 8.5". I hope this helps, thanks for shopping with us.